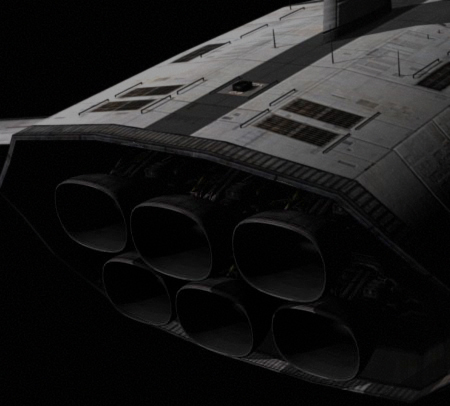 The Arrow Freighter class vessel was created for deep solar system exploration and exploitation. 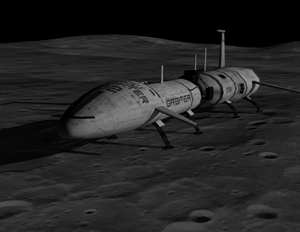 Its goal is mainly to make long range cruise and land on small moon without or with tiny atmosphere. 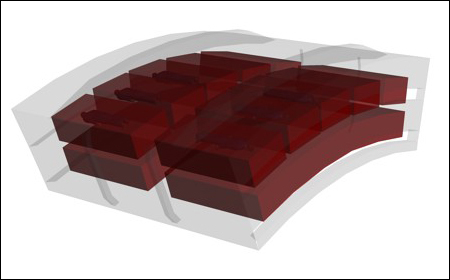 Its shaped hull was designed to resist about any chimic condition as for example Titan's atmosphere while the wings (that contain also rcs and radiators) help control and reduce constraints. First Arrow in construction the 15 october 2037 during the famous solar storm. All personnal where evacuated, the picture was taken by HMO SatCop. The first Titan's flight 27 may 2043 taken by a droped camera. RBK-H7 engines. Powerful but fragile until actual version (r23) went out in 2045. I'll not speak here about obvious fictionnal things but about thoses that seem unrealistic or strange and still have some good answers. The first problem is low gravity which is deadly on the long term for astronauts healt. In this domain the calculations show that the Arrow's wheel give about 0.62G (0.618G at head's point). The problem is that such small diameter wheel would give bad head-to-foot gravity gradient this is why its only used for sleep. The horizontal position in the gradient and the low activity almost solve the problems. 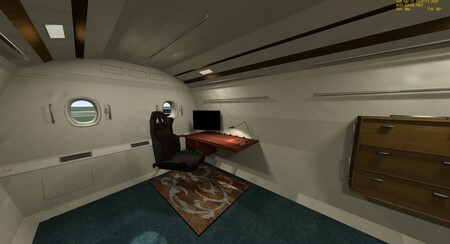 On the image you see the sleeping rooms and crew position in the wheel. Notice the center rooms (0.56G) are not used for sleep but for things that require minimal gravity as hydroponic. The radiations are another deadly problem for long range cruise. This is solved in the Arrow mainly by the use of double-hull, new anti-radiation material and the existence of radiation armored protection rooms in the center of vessel (surounded by tanks and all other systems) in case of very high radiation crisis. The windows are made of multi-layers materials included quartz (for temperature) and metallic compounds coating glass (for radiation). The opacity is also controlled by fast reaction sensor to protect eyes. Hover landing and take-off for a long and heavy vessel on relief terrain might be tricky this is why the landing gear are so long and equiped with height over ground mesurment lasers, weight captors and fast effectors to adapt themself to the terrain and keep the ship perfectly leveled for safe take-off. The aerodynamical hull have several good reasons do be done so even there is no air in space. Structural resistance and airtightness is much better and simpler to achieve with such shape and the Arrow can also land on moon with atmosphere included chimically agressive atmosphere as on Titan. 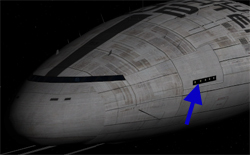 The Arrow cannot aerobrake but even descending in atmosphere at subsonic speed using the hovers is much easier whith an aerodynamical shaped hull and somes computer controled surface. The wings contain also RCS, radiators and several captors, antennas and instruments. 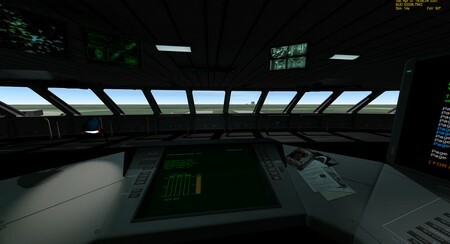 •Fully clickable Virtual cockpit with 4 MFD. •Bay and cargo zone local light. 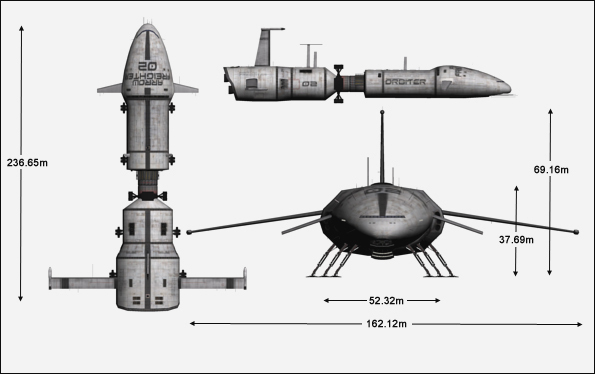 •Anim of bay door, gravity wheel, gears,rover and crew lift. •Engine power and various things as reserve consumption can be tuned by configuration file. on the left panel with a red frame around them are fake, just for the look. You can have a closer view of the front window and look around, hit CTRL+ALT+UP. 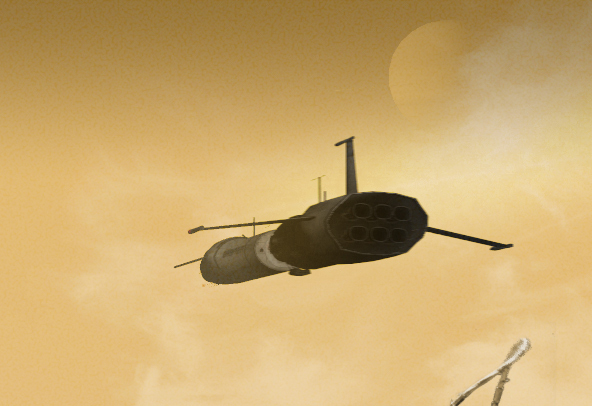 Landing such heavy ship can be tricky for newbies and no one in reality would land it manually. 1-Autoland need a XPDR or VOR frequency with a range of 1500km and will land right on the transmitter. 3-Arrange your orbit so it pass right over the balise beetween 10 and 25km high. 4-Launch the autoland pilot about 1000km before arriving to the balise. is 0.10m/s below 2m/s and 1m/s above. change (click on each screen) or set them off. Those setting are persistents. and 1%. 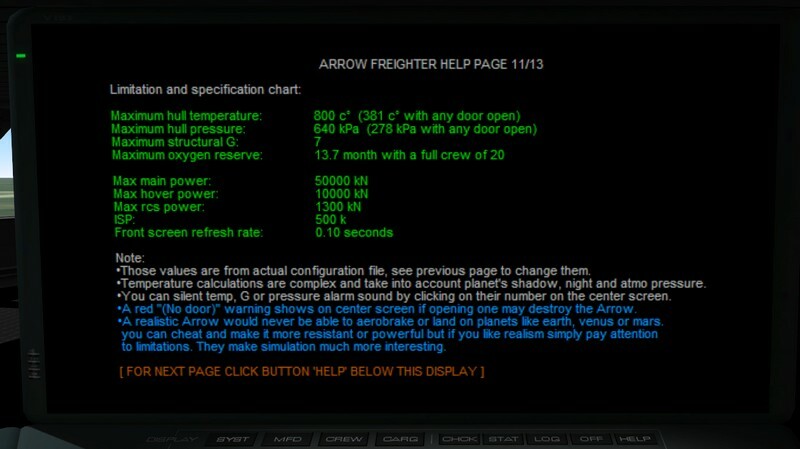 In this case the time acceleration reduce to 1x, this help you save your crew from suffocation. triggered. In an Ummu hit CTL+enter to know if there is action area in the vincinity. time acceleration mistake by almost 90%. •Countdown that reduce time acceleration smoothly to 1x as it reach zero. •Humain readable time display (years, month, hours instead of millions seconds). •Delay for time acceleration reduction to 1x can be set from 60 to 600 second before zero. and countdown before burn or maneuver. 9.65 month the time acceleration will reduce to 1x right on the delay you set (by default 60 seconds). Started by a button on center panel this mode is mainly for ambiance and is absolutely not mandatory. 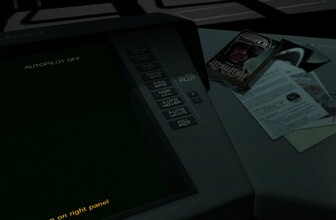 It simulate with sounds the fact that the crew is preparing the ship for a burn. 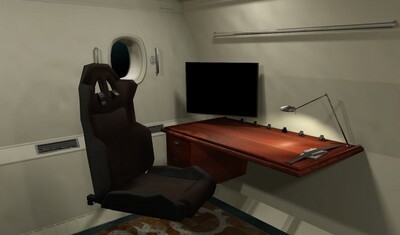 •A main announce is done as if the captain warn the crew about the maneuver. 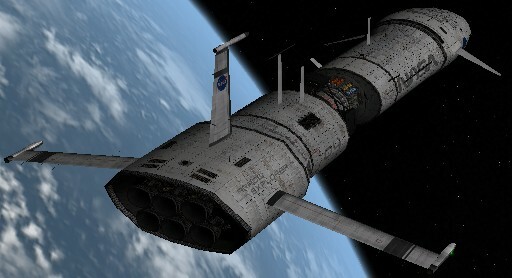 Noise of belt, system powering up, radios, doors and various. 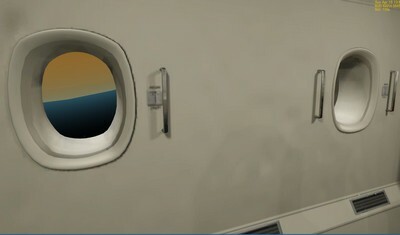 •In external view you can see the crew in cockpit wearing spacesuit with belts fasten. •All doors are locked simulating a "security mode"
•There is no penalty if you leave your crew with belt fasten during month. crew aboard during your important maneuvers. any action in it appart taking some rest and enjoy the view during long trip. key CTL+ALT+Up (CTL+ALT+ Down to come back) and finally CTL+Up to get back to the main VC. concern so this room serve only when off duty. There is a lot of bars, belt and the walls are made in soft material to prevent wounds. NOTE: You can use the countdown timer to get warned about maneuver in captain's cabin. •Turn on antialiasing or better use the new DX9 or DX11 engine for Orbiter ! without antialiasing. You can download the new DX9 or DX11 engine on the main orbiter forum. Even with those engines remember to turn AA, font quality and other quality setting to the max. •All my addons have been updated for DX9 and DX11, ensure you have the latest "2012" version ! This include OrbiterSound, DGIV (with new features), UMmu, UCGO and all my orbiterhangar addons. 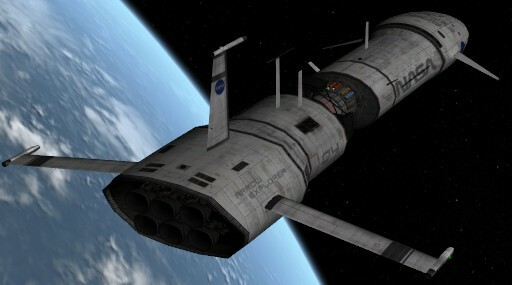 docked vessel when landing). The dock 2 is rotated at 90° so the XR5 can dock. acceleration as to look realistic during a long trip. Improper use of wheel will not harm your crew. the lift and stow it. The rover Azure can take two cargo on it's top. (Key "C" see cars' help). •Lack of oxygen, excess temperature, G, pressure or crash will kill your crew or destroy the arrow. In case of danger you'll have messages and sound and the time acceleration will be set back to 1X. •An UMmu can only enter or transfer in the active dock/exit. Remember to select the correct dock/exit. can browse trought all cargo available and add them with key or buttons. UCGO and some other vessels. shuttleA. 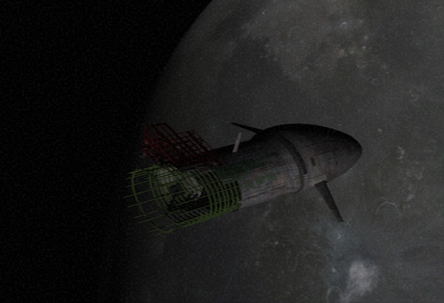 On orbiterhangar you can find a version that allow you to replace stock in every scenario. •You can change the 30 radio chatter sound, see folder "Sound\UCGOArrow\RadioChatter". •Set if vessel needs at least one crew to be controlled. •Change the refresh frequency of the center display. •Change the radio chatter delay. •Disable the ambiance sound for the security mode. •Disable the exhaust flickers effect. •Disable the auto IDS frequency selection. •Enable the wheel turning like a mad with time acceleration. CTL+Down Go to Captain's room (VC), CTL+Up to get back to main VC. 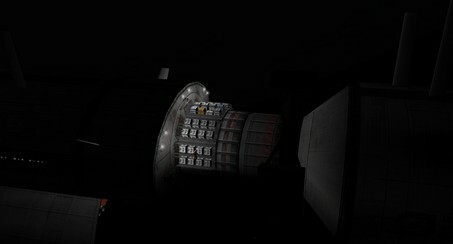 8 Cycle - trought cargos in Orbiter installation. 9 Cycle + trought cargos in Orbiter installation. SHFT+9 Add to first free slot the last selected cargo by key "9" or "8"
No html doc for this help topic ! 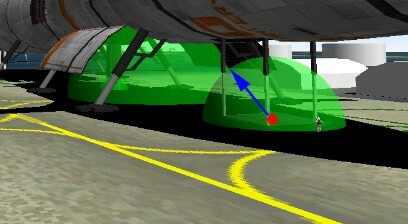 the Arrow's ingame help as they depend of the Arrow's configuration. •Create new roof screen mosaïcs. •Translate help, doc for your language's community. I plan more VC, more systems, more fun, I have a load of ideas for it. For now the Arrow is fully mature and its status is not anymore only a UCGO feature demonstrator. 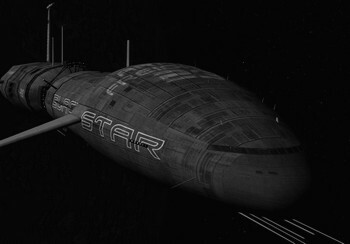 It's now one of the nicer Orbiter's futuristic ship and a great ship for system exploration. I wish you a lot of pleasure flying with it. supported me, you can find their name in the html doc.